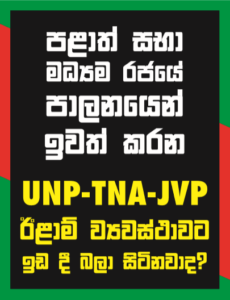 We refer to the numerous challenges issued by you to the Sinhalese urging them to debate with you on various historical and political matters related to the North-South conflict. The latest is the letter sent by you Mr. Gallage Puynwardana, President of Sinhale Secretariat with heading ” Vultures hover to devour Tamil ancestral lands” . In this letter dated 8/.6/18 you raise five points. has accepted your challenge and requested you to debate with him the listed issues in the letter sent by you to Mr. Punyawardana. We sincerely hope that you would kindly accept the invitation and debate the issues with Mr. Mahindapala for the public to gain a broader and an in-depth view of the controversial issues. You would no doubt agree that such a public debate would also contribute considerably for the good of peace and reconciliation. If you agree we will be glad to act as convenor of this debate and provide as much logistics as possible for its success. As things stand now we think that it is preferable to have the debate in December in a venue in Colombo. If you agree please contact us to work out the details. Your assistance in this will be much appreciated.